Synopsis: Twelve-year-old Kicken Petchio is not long for this world. Dying of "undisclosed cancer", his only escape is into the wizardly world of his favorite books: The Henry Shield Adventures, written by A.R. Crowling. When his father arranges for Kicken to meet his favorite author through Last Ditch Wish, Kicken gets more than he bargained for. As characters from the book come to life and Kicken crosses the threshold between reality and fantasy, he learns that nothing is ever what it seems. 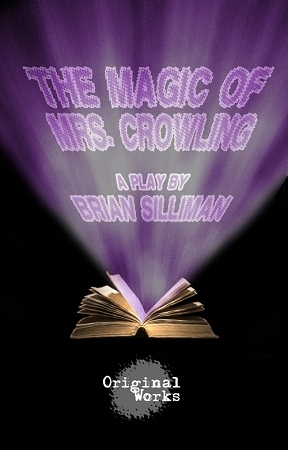 Taking its cue from the beloved Harry Potter and Lord of the Rings books, The Magic of Mrs. Crowling is for lovers (and haters) of fantasy everywhere. "Silliman has created a fantasy world that isn't the expected genre parody of Harry Potter in-joke fest, but a real and interesting place that bears revisiting." "This satisfying (play) ranges from pitch black comedy to oddly moving." "If you've ever used your imagination, this rough and riotous (show) is for you."